Fusion Media Group (FMG), today announced its first immersive VR production, Mars 2030, will be available to consumers in July 2017. Users will set foot on the Red Planet and take in 15 square miles (40 square kilometers) of Martian landscape, accurately mapped and modeled from real Mars orbital satellite data. The production has been developed in collaboration with NASA, allowing users to journey more than 34 million miles from home and experience an actual spacesuit prototype, get an authentic feel for driving the Multi-Mission Space Exploration Vehicle (MMSEV) Rover, explore a conceptual Mars Habitat design and more. During their virtual trip on Mars, users study the planet’s ancient geology, traverse challenging terrain such as lava tubes, frozen lakes and lofty mountainsides while facing realistic weather conditions, atmospheric pressure and the challenges of partial gravity. Consumers will be able to enjoy Mars 2030 in virtual reality on HTC Vive, Oculus Rift and PlayStation VR, via $14.99 download; the experience will also be accessible to users without a VR headset on PC and PlayStation 4 and PlayStation 4 Pro. Mars 2030 was built using Unreal Engine 4, customized to handle the challenges of reproducing the real-world Martian landscape at optimal framerates and up to 8K resolution. It features an original score from the London Symphony Orchestra with situational music cues designed to heighten the emotion of exploring the Red Planet. Ambisonic surround sound propagates sound realistically from every direction, deepening the user’s immersion. Face the daily challenge of operating, maintaining and repairing equipment from the Habitat base, which has been modeled after an actual NASA design for Mars habitats, including the VR Communications center for reaching out to “Houston” and family members back home. FMG’s experimental production unit informs, provokes and entertains by creating virtual worlds and interactive experiences that transport users to iconic places, authentically re-created and grounded in science and history. Previous work includes state-of-the-art Hybrid Reality installations including National Geographic’s Mars: The Live Experience. The team takes the best elements from documentary, gaming and VR categories and combines them into a unique and deeply immersive content offering. Mars 2030 provides users the unforgettable experience of being an astronaut on an international mission team to the visually breathtaking planet of Mars. 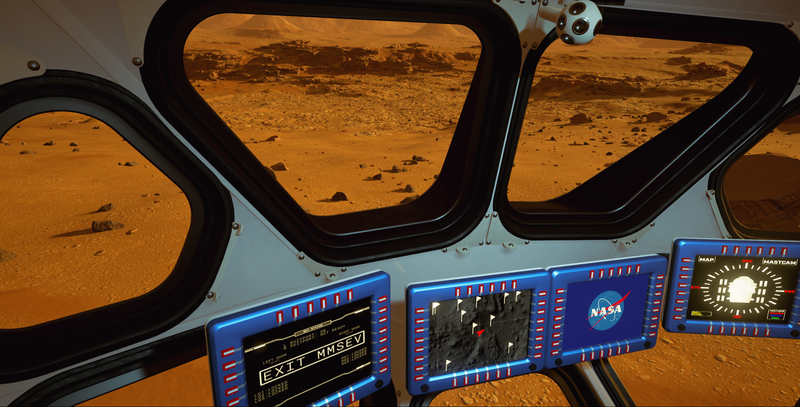 Mars 2030 is the inaugural release for FMG Studios and developed in collaboration with of over a dozen space laboratories including; NASA’s Johnson Space Center, Langley Research Center, and Jet Propulsion Laboratory, and MIT’s AeroAstro Lab. The VR experience will be available to download for $14.99 on both PC and PS4, supporting HTC Vive, Oculus Rift and PlayStation VR. A non-VR version is available on PC as well. The VR experience will also be available free of charge for educators and students.